During the past 20th Century, Alaska witnessed change on a grand scale. Each discipline represented by Harriman's team -- ethnography, geology, zoology, botany, the arts -- has its own way of assessing the transformations that have been visited on Alaska's coast by such colossal events as volcanic eruptions at Katmai of 1912, the Lituya Bay tidal wave of 1936, the earthquake that rearranged Mount Fairweather in 1958, the oil spill that polluted the coast of Prince William Sound and the Alaskan Peninsula in 1989. 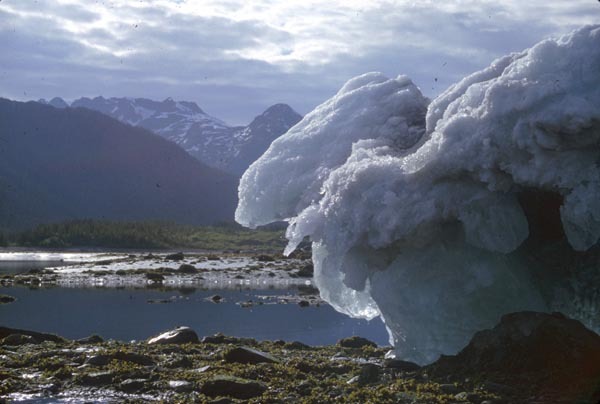 A stranded berg melts in the sun in Prince William Sound, 1999. Harriman's team could well have been equally interested in the subtler changes that have taken place during the Twentieth Century. At a distance of one hundred years these seemingly small events have taken on great significance. 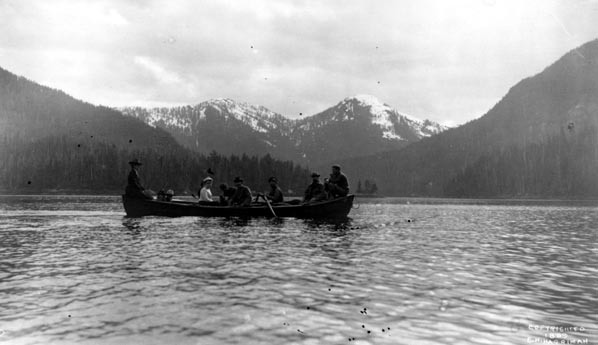 In Sitka, in 1912, Southeast Alaska Natives formed the Alaska Native Brotherhood, to gain recognition for land and fishing rights in Tlingit and Haida territory. In 1920, a squadron of U.S. Army's Black Wolf Squadron flew from New York to Nome (with many stops in between), and demonstrated for the first time the feasibility of air travel in Alaska. KENI-TV of Anchorage was the first Alaskan television station in 1953, and was a harbinger of the satellite, wireless and electronic communications that, by the end of the twentieth century, effectively connected Alaskans with each other, and with the world. Alaska is no longer isolated by its distance from "the lower 48" and the nation follows Alaskan headlines and TV reports the way we do any events throughout the county. 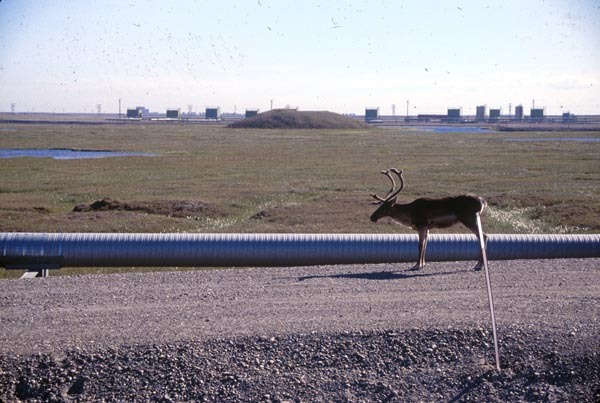 A caribou stands beside a pipeline at one of the oil fields on Alaska's north slope. Oil has proven to be one of Alaska's richest resources. The 2001 Harriman Expedition Retraced looks at these changes, grand and subtle, using the 1899 expedition findings as a baseline. Follow the links to brief comparative pieces on changes in poetry, art and tourism, and for reports on the changes in science and culture along Alaska's coast. 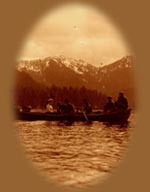 Exploring in Prince William Sound 1899. Exploring in Prince William Sound. Source: The Bancroft Library. "Great changes have taken place. The Pacific Glacier has melted back four miles and changed into three separate glaciers each discharging bergs in grand style. One of them, unnamed and unexplored, I named last evening in a lecture they made me give in the social hall the "Harriman Glacier" which was received with many hearty cheers. After the lecture, Mr. Harriman came to me and thanked me for the great honor I had done him. It is a very beautiful glacier." John Muir, writing about the expeditions observations in Glacier Bay, June 14th, 1899.